Listen Everybody (Edify LPNVS1003) 1973? 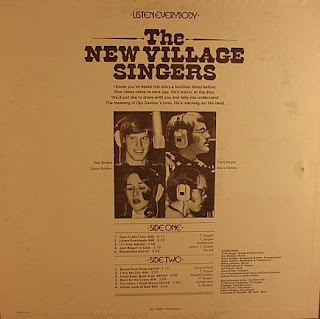 The New Village Singers are a friendly easy-going folk foursome that bring to mind the music of The Seekers. Listen Everybody debuts with sharp production emphasizing clean vocal harmonies, jangly guitars and crisp rhythms. Nice arrangements mix in flute, harmonica or piano where needed, all the while making sure the folk edge isn’t sacrificed for easy listening or MOR. They seem particularly fond of Love Song, covering five of their songs over the two albums. In fact New Birth opens up with ‘Since I Opened Up The Door’, revealing some of their newly introduced Jesus music country twang. The beat is set aside a few times for some pure acoustic tunes including renditions of ‘Love Song’ (the Elton John one) and Debbie Kerner’s ‘Behold, I Stand At The Door’. Good soothing stuff that isn’t gonna hurt anybody. (Ken Scott – The Archivist). No, it’s not gonna hurt anybody. On the contrary, very pleasant album. Good voices. Thanks for sharing.